Charles O’Dell KD5NWS has one wish for his boys in Royal Rangers: a ham station at every Royal Ranger Pow-Wow in the United States. Pow-Wow is a camp-out held once a year throughout the U.S. In June 2011, the Oklahoma-Southern Kansas-Northern Texas regional Royal Rangers' Pow-Wow was held near Bell Cow Lake near Chandler, OK. About 5,000 boys attended from all over the country. The boys participate in paint ball, swimming, hiking, and blacksmithing. They learned camping and other skills. 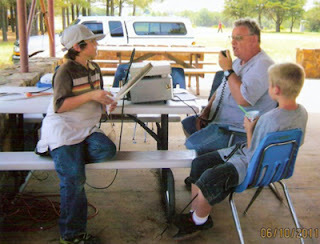 O’Dell set up a Ham station at the Pow-Wow to promote Ham radio to the boys and range leaders. The boys made contacts with 50 other hams and one in Canada. 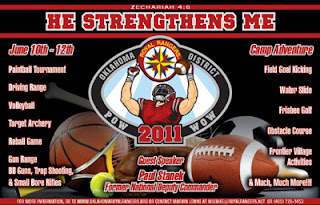 Dolph Grolock KB2AW of Luther, OK, helped set up and took photos of the event. 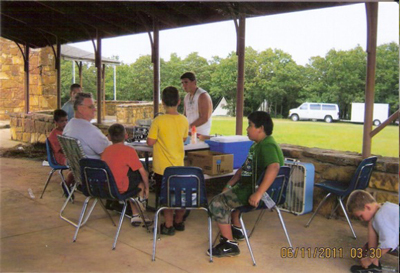 Royal Rangers is an outreach of the Assembly of God church; however, many independent churches sponsor Royal Rangers programs as well. A boy can join by attending a meeting. He does not have to be a member of the church. 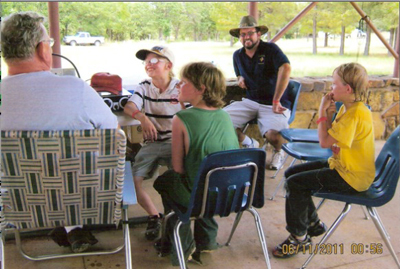 In addition to local meetings and events, Royal Rangers sponsors a National Camporama in Eagle Rock, Missouri. O’Dell has been involved in Royal Rangers since 1963. 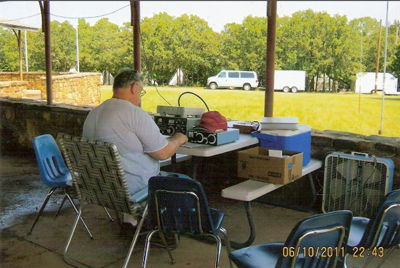 If you would be interested in helping with the Ham station next year, please contact O’Dell at KD5NWS@aol.com. I am sad to report that Mike McEwen has resigned as the EC for Comanche Co. due to a new job and not enough time to commit to ARES. I would like to thank Mike for your commitment and willingness to help ARES-OK. Should your situation change, and you find you have time on your hands, we can always use help. I also need help. I need EC’s in the following counties; Caddo, Comanche, Cotton, Tillman, and Washita. Please visit with any operators, or clubs. We need their help and input in finding volunteers and leadership in all Zone 2. I also need help in locating DEC’s for District 1 (Beckham & Washita) and District 2 (Caddo & Grady). Leadership positions can be obtain by contacting me for details. Anyone interested or appointed must be a member of the American Radio Relay League. Please remember to recruit. We need all the help we can get. The SET is coming up on Oct 1, and all EC/DEC are required to attend/participate. Please contact me if I can provide any assistance. their communications trailer at the festival. getting on the radio, it is going to be great! always welcome to stay and observe the program and your child’s participation and progress. takers please let the students know they are getting out. and repeat visitors will probably find a new student to engage. tweet once we are setup and operational each day and have students presents. If you see us self spot, please call (that's code for kids want to talk to you!). If the web cam is operational, go to www.hamsoncams.com and observe the fun. Look for the account of kc5cyy. There is a link on the www.qrz.com/db/k5usa K5USA QRZ page too. school, club, museum, ship, troop or yourself. Repeat visitors always cause renewed excitement. BTW, updated and added some photos from the recent power plant trip and other activities, check it out and enjoy! 73 and have a great weekend! Well, the heat wave looks like it has finally subsided and our year of seriously lousy weather is winding down. I would first like to thank all the ARES members in the section for a job well done during record weather year. Whether you are part of the ARES-OK management team or a volunteer, THANK YOU for all you have done and I’m sure will do in the future. Speaking of ARES, don’t forget the Simulated Emergency Test (SET) coming up Saturday October 1st. If you are in the dark about what the SET is or how to participate, just contact your local EC or our Section Emergency Coordinator, Mark Conklin, n7xyo@yahoo.com. One of them can assist you with the information. Lets have a good showing for our section SET. A lot of you are taking the time to set up public displays at your local county fairs….and if you aren’t, you should be. Be on the lookout for opportunities to put ham radio in front of the public. If there is a county fair, or some other special event going on in your area where there will be a lot of foot traffic moving by, get in and set up a special event station and demonstrate ham radio. If you have a big local mall or the local Wal-Mart store, get on their calendar now to set up a display some Saturday between Thanksgiving and Christmas. Have a VHF or UHF station set up and one of your other hams in the parking lot or at home and let the kids that come by “talk to Santa”. Not only will the kids be thrilled, but their parents will see your group and ham radio in a very positive light. Not to mention the possibility of garnering interesting for your next Tech class…. Your club is teaching classes aren’t you?? It’s the easiest way to build your numbers. Just make sure you have a competent instructor that knows his stuff and can make it fun. Division Director, David Woolweaver, K5RAV and Vice Director, John Stratton, N5AUS, Mike Corey, W5MPC, ARRL Emergency Preparedness and Response Manager and myself will be in attendance. Henry and Tina Allen as well as the entire Texhoma Hamarama Board have worked to make this hamfest one to remember. We will have an ARRL Forum. salute them for a job well done during the National Convention. Neil - KE5BUS, Sarge - KE5TPB, Fred - K5QBX, and Walter - AE5IT. Rick - W5TUX and Kirk - KE5RBB . 2) Brian – WA5M for coordinating the tailgate operation. Amateur Radio Operators and its local community. ARRL_WGD and on Facebook at ARRL West Gulf Division. are planned once we have gained some experience with these three. as a member. All users should read the Rules before they participate. that worked so hard to make this another successful convention. 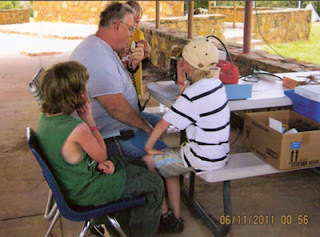 Convention and the Summer Meeting of the Texas VHF-FM Society. of the upcoming agenda items pending for the upcoming WTRC 2012. Lori KM5MQ and their volunteer helpers. General Class and 6 Extra Class licensees. Summerfest Treasurer and Don Weiss, K9UI the Summerfest Secretary. down on your Hamfest calendar for August 3rd and 4th, 2012. Mesquite, Texas for almost two decades. the ARRL Diamond Club or the Boy Scouts of America. West Texas. Howard joins the WTX team following the retirement of J.T. ARES, the American Red Cross and just plain having fun! the section to voice their appreciation to WA5ZFH for a job well done. and radio time in his classroom, an opportunity she readily accepted. are part of her character. dedication drives her, as well. While the WGD congratulates Kaitlyn S.
forward to many years of her engagement in Amateur Radio! be QRV as K5B during the Plano Balloon Festival, September 16-18th. 147.180 + PL 107.2 and via Echolink at K5PRK. QSL with SASE to K5B. the opportunity to again call "CQ West Gulf Division" from W1AW. see and meet some of the NWS personal we work with. partake in a future training exercise with them. time. We can split up into groups and tackle many at once. Melissa Wilkerson has been appointed as the ARES PIO for our group. will be coming in the near future. Emergency Communication" course locally and get our certificates. DAM J.A.M. #20 is Saturday, September 10, in Pryor, OK. We're still in need of at least half dozen more hams to provide stationary and rolling coverage out on the routes. If there's any way you could come out to help, we'd feed you, give you a shirt, cover the cost of fuel used, and sincerely thank you. We're gathering in Whitaker Park, Pryor around 6:00 a.m. If you can help for all or part of the day, please contact: Jim Beach, KE5URF, at damjamjim@gmail.com , or call 918-639-0362.